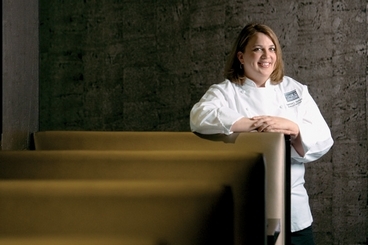 For Executive Chef Heather Terhune, Sable Kitchen & Bar presents a thrilling opportunity to continually push her ingredient-driven food philosophy in new directions. Focused on New American social plates, Terhune elevates classic dishes with contemporary flavors, building upon a decade of experience perfecting American comfort food at Chicago’s beloved Loop mainstay Atwood Café. Terhune uses Sable’s state-of-the-art open kitchen to interact with guests and serve food that is both innovative and appealing in its simplicity. “My focus is on the quality of the ingredients, not the quantity,” she explains. A recent contestant on Bravo’s Top Chef Texas, Terhune made it to the top ten in the competition. Catapulted to the national stage, Terhune’s talent, passion and determination shone through week after week. But before the lights, cameras and Sweet Corn Crème Brûlée (one of Sable’s signature menu items), Terhune grew up in picturesque St. Albans, Vermont, and first discovered her passion for cooking while canning vegetables and making preserves under the watchful eyes of her mother and grandmother. Terhune's family knew something was up when she asked for artichokes and spare ribs as a fourth birthday present. The procurement and preparation of sustenance has been on her mind ever since. Enjoying the natural bounty of Vermont was a way of life for the Terhune family, who hunted, fished, gardened, tapped trees for maple syrup and even raised pigs. “I think my dad always secretly wanted to be a farmer,” she says. The Terhunes later moved to Missouri, and Heather graduated from the University of Missouri (Columbia) with a Bachelor of Science in agriculture and hotel/restaurant management. Next stop: the New England Culinary Institute, from which she graduated in 1995. Terhune began honing her craft as a professional chef in The Willard Room at Washington, D.C.’s venerable Willard Hotel, often described as the “crown jewel of Pennsylvania Avenue.” Other posts in D.C. included The Watergate Hotel’s famed Jean Louis restaurant, where she worked under Michelin three-star recipient Jean Louis Palladin until his retirement. Terhune then moved to Durham, North Carolina, to work at Pops Trattoria as Executive Sous Chef and Pastry Chef. She later helped open Mossant Bistro (now South Water Kitchen), and, at age 28, was promoted to Executive Chef at Atwood Café. A fan of the “eat local” movement, Terhune has found a way to incorporate Midwestern ingredients into Sable’s menu by having many of its supplies delivered by Rink DaVee of Green & Green, who helps Terhune to connect with roughly 20 area farmers. “Working with Rink allows us to have the benefits of farmer’s market shopping,” Terhune says. Terhune is a major supporter of sustainable and organic agriculture, including Chicago's own Green City Market. Terhune lives in Chicago’s Lincoln Square neighborhood and spends her time outside the kitchen exploring her vibrant city, its lakefront and culinary scene.